"So to sum up my question: Is it possible to 'argue' that my ordinal dependent variables can be treated as continuous and I can therefore use FE for them as well? If yes - could you point me towards the appropriate literature/methodology? Or is this not possible and I need to use logit/probit for the ordinal dependent variables?" The core of the question--can an ordinal dependent variable be treated as "continuous"--comes up most frequently in the survey context where a response involves a Likert Scale (typically a 5- or 7-point scale -- or an even-numbered scale that pushes respondents off a mid-point response). While reasonable minds can--and do--differ on what modeling options may plausibly exist, at the very least, and as a first step, a researcher would need to closely examine how any ordinal dependent variable distributes as this may itself limit model selection options. Sara - We definitely need to think more about how we can operationalize some of the features of "judicial temperament." I personally need more time to really think this through, so I instead thought it might be good to write about the question that keeps running through my head as I try to operationalize judicial temperament. The issue I'm struggling with, and which I'd love to hear the thoughts from others, is how we guard against imputing too much to the obvious proxies we'd have to use. For example, to play devil's advocate, I'm interpreting your suggestion of using the Congressional staff variable to reflect the quality of "open-mindedness" as implying that the political nature of the job might actually point towards close-mindedness. The question is whether that is reading too much into what it means - or what the ABA perceives it to mean - when someone has served on a Congressional staff. We thought about it in two terms: (1) an obviously political position, but also (2) a not-always-good substitution for traditional legal experience, especially given the political nature of the job. Put another way, did the person get the nomination because of their political service, or due to their qualifications? However, is the acknowledgement of the political flavor of the appointment and the nominee's background the same as measuring whether a nominee will be viewed by the ABA as "open-minded"? Alternatively, by this definition, our inclusion of the Years as Public Interest Lawyer could be seen as another measure of potential "open-mindedness" or "commitment to equal justice" given the equal justice-nature of much public interest work. But, again, are we presuming too much to suggest that the ABA views such work in this manner? Finally, what are service as a government attorney? The vast majority of people in this category - which we found the ABA viewed positively - serve as some type of prosecutor. Is this a signal of substantial courtroom and/or litigation experience, or could one possibly somehow link such experience - either positively or negatively - to some of the suggested ways of understanding "judicial temperament" in the ABA's guidelines? More broadly, how do we make sure that even our operationalization of these terms does not in and of itself make judgments? For example, does it (or should it) matter who the staffer worked for in Congress? Does it matter what issues the staffer focused on? Of course, much of this relates back to Sara's initial post about the impact of the ABA's investigations - it's not merely that someone was a judge, but that the ABA attempts to determine whether they really were a fair and impartial judge. The problem, however, is that we have little to work with on the outside. We could obviously attempt to look into the information brought forth by others (i.e., the media, interest groups, senators, etc. ), but (a) most nominees receive little attention if any, and (b) the information we hear publicly about is likely to be somewhat biased. In fact, as a side note, a big problem is the lack of information on nominees -- when I was constructing a list of nominees who were opposed by interest groups, there were a surprising number who has zero articles written about their nominations, including passing mentions that they were nominated and/or confirmed. Which brings us back to the issue of how do we attempt to explain something - or some idea - for which we only have limited information and potential proxies? Finally, we will certainly work on creating a more nuanced ideology measure. The one question, Sara, is were you referring to the distance between the ABA committee and the nominee or the distance between the Judiciary Committee and the nominee? The issue is that, and forgive me if I’ve totally misunderstood your post, is that I'm just not sure what it would mean to hypothesize that the ABA Standing Committee's ratings are influenced by how ideologically distant the nominee is from the Senate Judiciary Committee. This would in turn have to mean that we believe that the ABA is more likely to rate nominees highly in times of unified government (when the ideological distance would be closer), and rate them less well in times of divided government (when the ideological distance would be farther). And, this would suggest the ABA's ratings are in part driven by the makeup of the Judiciary Committee, rather than based on the nominee's background. Obviously, if we could create some measure of the ABA Committee's ideology that we could then compare to the nominee's ideology, that would be great.... Last thought: yes, determining whether the bias has switched over time is definitely a worthy question; the issue, as always, is getting the data. Sara - thanks again for really pushing me/us to think about these issues! Re: Chris's post yesterday, the only possible response is to say thank you for such a great suggestion, and the reminder to pay close attention to how one describes what their model actually does - and for providing us with all of the information on how to put that suggestion into action! We appreciate the guidance!! And, we'll let you know what we found as soon as we're done. Thoughts on "Bias and the Bar"
Rich, Amy, and Susan have done a great service by writing their study. My comments here focus on a specific aspect of the paper: the issue of causality. The paper itself makes a number of explicitly causal claims, referring (for example) to the "most influential causal factors" that might determine ratings, and to the construction of "a series of causal models" (p. 11). My narrow point is that models of which they speak aren't really causal models at all; they are straightforward regression-type models, of the sort social scientists do a lot of. That isn't a criticism of what they've done, but rather just an observation, albeit one that suggests a simple change in approach. Manipulability theories of causation (perhaps most famously set out in Holland's (1986) paper) -- upon which most of the current approaches to causal inference are based -- certainly have their critics. But they have a natural application to the central question of the paper: What ABA rating would nominee X have received had s/he been appointed by a Democratic president, rather than a Republican (or vice-versa)? This (to me) suggests that the paper is an obvious candidate for a matching-based analysis of the influence of (e.g.) party on ABA ratings. Such an approach is (a) very easy to do, as a practical matter, (b) allows one to control for other potentially confounding factors, and best of all (c) provides a direct answer to the question posed above that can be interpreted in causal terms. These approaches are increasingly widely used in empirical legal studies, and seem (to me) to hold particular promise in addressing the authors' central question. Jason and I haven't had a chance to coordinate on this, so rather than trying to speak for both of us, I'll offer my thoughts and he can chime in with his own if he is so inclined. First, I'd like to thank everyone for their thoughtful comments and critiques of our paper. You've given us a lot to think about and the next draft of the paper will be substantially better because of your input. Second, there's been a lot of talk over the last two days about ways in which our data might be refined and improved. There is clearly a great deal of useful work that could be done in this area and I hope that our study will just be the beginning of a more well-informed discussion of the student-edited law review and how it fits into the overall schema of legal scholarship. I, for one, would be particularly interested to seem some empirical data, expanding on Christine's "armchair empiricism," that examines what law reviews actually publish. Somewhere between what editors say they consider and what they actually publish lies the truth about how these decisions get made. Finally, I want to thank Bill Henderson for seeking us out and organizing this forum. It is, of course, always nice to have someone come from out of the blue and express interest in your work. But the forum has also been useful for us and, I hope, for everyone else as well. My Ph.D. thesis director once advised me that "if it's worth doing, it's worth doing badly." His point was not to make the perfect the enemy of the good, particularly when conducting truly original research. So it's important to preface any critique of their work by acknowledging that, whatever flaws their study may have, Nance and Steinberg have done a great service to the legal academy by shedding some empirical light on the question of law review publication. As is the case with any empirical paper, methodological criticisms of their work are among the easiest to offer. One could question their decision to use conventional factor analysis with ordinally-measured response variables (particularly when better techniques exist), or their extensive use of tables when figures (such as the one above; click on chart to enlarge) typically do a much better job of conveying complex statistical results. My biggest concern, however (and one prefaced by Michael's comment to Bill's first Forum post) is the effect of social desirability bias (hereinafter SDB) on the study's findings. SDB refers to survey respondents' tendency to answer surveys in manners they think are socially (or, here, professionally) desirable or expected of them; it is a well-known and commonly-observed phenomenon in survey research (a recent paper with a list of current references is Streb et al.). I'd contend that the presence and effect of such bias can explain both their intuitive findings as well as some of the more unexpected ones. Articles editors (AEs) undoubtedly are interested in growing the prestige of their journal, and in minimizing their editorial workload. They are also, however, socialized into the law review culture; they understand that law reviews, as forums for scholarly work, should publish the "best" (most original, creative, important, well-reasoned, persuasive) scholarship they can. As AEs, their professional role is to select such work for publication, and to do so in a way that doesn't systematically disfavor authors or work on the basis of other (putatively irrelevant) criteria. SDB suggests that AE's survey responses will likely reflect their desire to be seen as conforming to that role. Consider Nance and Steinberg's rather odd finding that, while "Author Prestige" is among the most influential of their constructs, "Notability of the Author" ranks dead last in the rankings of publication criteria. The phrasing of the authors' 56 "influence" questions is such that none is dispositive; each can influence the publication process without making or breaking a given paper. In contrast, asking AEs to rank order the seven publication criteria forces a zero-sum choice: for one criterion to be ranked higher, another must be ranked lower. That, combined with the relatively small number of items to be ranked and the presence of SDB effects, makes it difficult for an AE to place "Notability" high in the rankings. 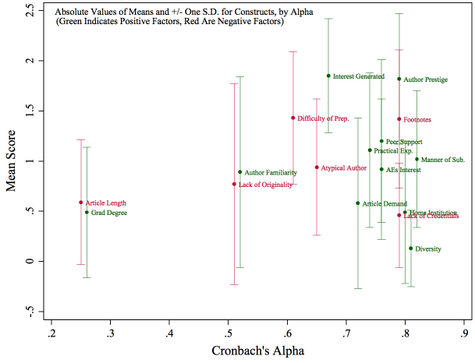 A similar dynamic might explain the relative weakness of "negative" author traits: while AEs can be forgiven for privileging work by high-prestige authors, it is considered much less acceptable to disadvantage low-prestige ones. Finally, in our post-Grutter world, it is likely that most AEs almost reflexively responded "no influence" to questions regarding the effects of author race and gender. But while SDB is a potentially serious problem, it is by no means insurmountable. A standard way of assessing the presence of SDB is to compare survey responses with actual behavior; as Michael suggested in his earlier comment, the obvious means of doing this would be to analyze data on actual submissions and acceptances. Barring that, SDB can be reduced in surveys through anonymity; survey respondents who are assured that their answers will be anonymous are typically less affected by SDB than those who can be identified. Over the next couple of weeks, the law journal submission season will enter full swing. Because there are only a limited number of publication slots at elite law journals—and there is a perception, if not a reality, that a strong placement affects pay, promotion, and lateral offers—this positional competition creates severe angst among law professors that often ends in disappointment. To help elucidate the inner-workings of this process, the ELS Blog will be hosting a forum today and tomorrow (August 14-15) on a recent empirical study by Jason Nance and Dylan Steinberg, “The Law Review Article Selection Process: Results from a National Study.” The authors are 2006 graduates of the University of Pennsylvania Law School, where they served as Articles Editors on the University of Pennsylvania Law Review. Both authors are currently serving as clerks in the federal judiciary. This forum will also include commentary on the Nance-Steinberg study by Benjamin Barton (Tennessee Law), Christine Hurt (Illinois Law and The Conglomerate), Ahmed Taha (Wake Forest Law), and our own Chris Zorn. I will begin the forum with a short summary of the Nance-Steinberg study. For scholars interested in empirical research, no number is more important than .05. To paraphrase a 1967 article, the difference between .05 and .06 is the difference between right and wrong, creditable and embarrassing, success and failure. See James K. Skipper, Jr., Anthony L. Guenther, and Gilbert Nass, The Sacredness of .05: A Note Concerning the Uses of Statistical Levels of Significance in Social Science, 2 American Sociologist 16-18 (1967). When something is significant at the .05 level, we know it must be important. Well, maybe this is not quite right. So this week two guests will share their thoughts on significance testing and how best to think about it. First, we have Ramon Henkel of the Department of Sociology at the University of Maryland. Along with Denton E. Morrison, Professor Henkel co-edited The Significance Test Controversy (Aldine 1970), which was just reissued last year. (It includes the previously mentioned Skipper et al. article.) Second, we have Lawrence Mohr of the Department of Political Science at the University of Michigan. Professor Mohr is the author of Understanding Significance Testing (Sage 1990). A big ELS Blog welcome to them both. This is the last of our series of five installments on content analysis of judicial opinions, which we hope prove to be useful for those who want to undertake or refine this method down the road. A major advantage of content analysis is the ability to delegate much of the grunt work to student coders. But our experience, and that of some others we’ve heard from, is that students can be dangerously prone to errors or misunderstandings. Avoiding these requires laborious stages of piloting, training, documentation, and double-coding. Is this worth the effort? Fewer than a quarter of the 125 projects we reviewed used student coders primarily; in the rest, the authors appeared to do their own coding. Our view is that student coders should be used when this adds value and not just to save effort. In other words, sometimes students can do a better job than faculty can on their own. Here’s why. Realize, first, that the methodologic purpose of content analysis is to bring scientific objectivity to a reading of cases. If that isn’t your purpose, then why bother? The method’s scientific rigor arises from the replicability of coding, which should be demonstrated rather than presumed. This usually requires double-coding to show inter-coder reliability (or consistency) – i.e., that different readers would find the same content you found. But, it can be difficult for non-expert student coders to agree on the more legally-relevant content of cases. Faculty coding may be essential when analyzing more subtle, latent, or judgmental -- i.e., more interesting -- aspects of cases. The reliability problem isn’t solved, however, simply by shifting to faculty coding. Just because you’re an expert, your coding is no more self-validating than is a student’s. That’s why, from a scientific point of view, coding by 3 students is more rigorous than coding by the single greatest scholar in the world. To demonstrate replicability, faculty who do their own coding should also have some of it double-coded independently, perhaps by a similarly-expert colleague. But, when the subject matter allows for student coding, that may be a better way to go, both for reasons of expediency and reliability.